Leighann Gillis is a 30 year old caregiver from Westbrook, Maine. One of the things that stood out for us in her experiences, is the vast and complex nature of the various bureaucracies that caregivers have to navigate in order to ensure their loved ones get the care they need. Which stands in stark contrast to the expectations that people have for the skills and dedication of caregivers. She also supports the Homecare for All initiative on the Maine ballot this November 6th. Leighann Gillis and her client. For the past six years, I have been working with the same young woman who has a severe disability. She has been diagnosed as MR, autistic, non-verbal, and bipolar, as well as having osteochondromas on her bones and in her joints that effect her gross and fine motor skills as well as mobility and flexibility. In spite of those diagnoses, she spreads happiness wherever she goes, has a smile that can instantly transform your whole day, and loves unconditionally. She has taught me so much. After previously getting care through section 28, which provides community support services for children with cognitive impairments, my client was supposed to transition into Section 21, which provides services to Mainers who need ongoing, in-home supervision. Instead, even though she is considered high priority, she was put on a waitlist and received a bare minimum of state-provided care. I was downgraded to a Personal Support Specialist so I could care for her. My pay was cut, and I still had no paid time off, paid sick days, or health insurance. At one point, I was working three jobs to make rent and pay my bills. I suppose I should have called it quits and worked full-time somewhere, but why should I have to put aside a job I love, and leave the people I deeply care for, just to have decent pay and hours? 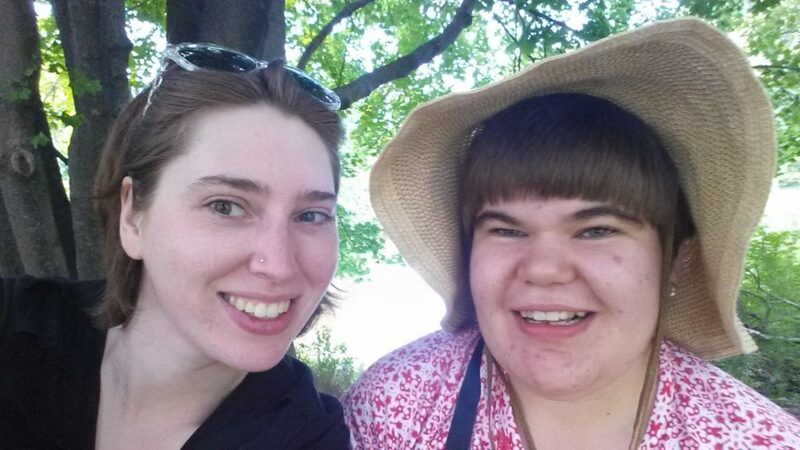 Together we transitioned to Section 17, since she had a mental illness diagnosis. But then, the state cut Section 17 and almost everyone was kicked out of the program. Finally, five long years after losing Section 28 services, my client was able to receive the Section 21 care she desperately needed. Another Direct Support Professional said something that has and will always stick with me: they told me that the workers in this field are considered by the state to be low-skill, low-education, and aren’t expected to last long in the job. There are so few worker protections and no unions, which means low wages and lack of benefits, like PTO and paid sick days. This means that workers are going into to work sick, and potentially getting their client sick. Workers are treated and paid poorly, which can make them less diligent and potentially lower the standard of care for individuals that just want to live their life as normally and inclusively as anyone else. We care for your children, parents, wives, husbands, aunts, uncles, and grandparents. We provide them with the opportunity to remain in their homes, and the dignity, relief, and joy that comes with being able to stay within the community they know and love. We remove the fear, anxiety, and despair that comes with the potential of being placed in an institution or nursing home. We deserve wages, benefits, and protections that reflect that. I’m proud to stand together with seniors, workers, family members, and all of the Mainers who care about making things better. Follow the stories and experiences of Leighann and others and join in the conversations about how we create community and break the isolation of caregivers on our Facebook page and on Twitter using the hashtags #WeKnowYouCare and #NationalCaregiversMonth.